Sewer Background Update + PAX East Excitement! Visual updates for some levels, and getting ready to fly to Boston for PAX East. Let's Design a Dungeon Dweller! From start to finish, my thoughts and techniques for creating a brand new Skelattack NPC! My design philosophies for creating homes as interesting as the characters who live in them. After showing my first game at my first convention, I take some time to look at the pros/cons of the experience. My 2 year quest to make the game accessible, without losing any of its flavor. Composing the hidden stories that this world is built upon. How random numbers work to create a unique experience in Skelattack. A detailed look at what makes Imber a special companion. A quick rundown of what it takes to design characters for Skelattack. 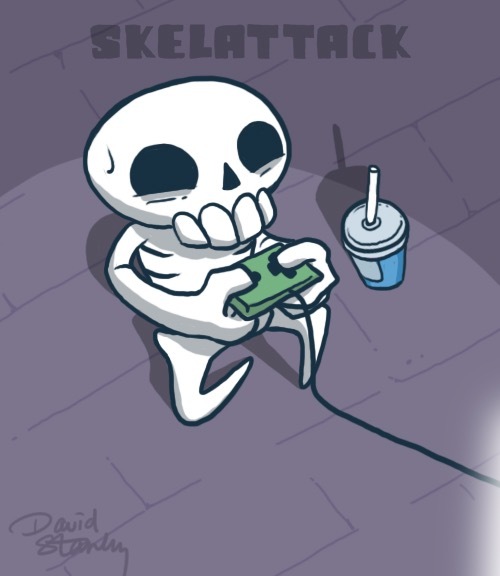 Game Music: One of Skelattack's most important characters. Allowing my characters to tell their own story, after wrestling with fears of how to program the dialogue system. Skelattack Gets Picked Up by Ukuza! From GameMaker practice project to a publishing deal.